APSSA, Amaravati - Primary Education - PEMANDU lab initiative - Ananda LahariAbhyasana (ALA) - Launching of ALA schools by Hon'ble MHRD Minister Sri Ganta Srinivasa Rao garu in Visakhapatnam on 07.08.2017 - Similar Programme in all districts - Instructions - Issued. 3. 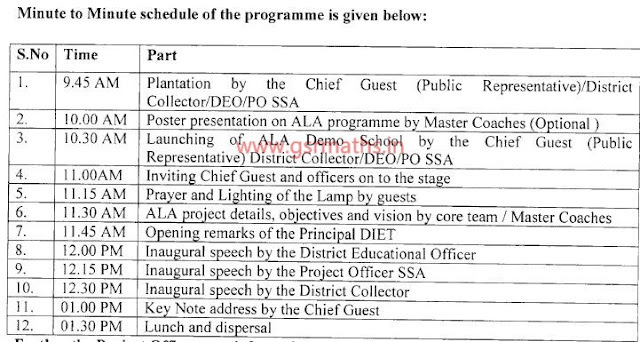 Proceedings of the commissioner of school education, A.P, Amaravati. 4. Minutes of the meeting on ALA programme, held on 26.07.2017. All the District Educational Officers and Project Officers of SSA in the State are hereby informed that Hon'ble HRD Minister Sri Ganta Srinivasa Rao Garu has to launch ANANDA LAHARI ABHY ASANA (ALS) Programme in MPPS Srikrishna Puram, Chinagadili (M), Visakhapatnam District on 07.08.2017. 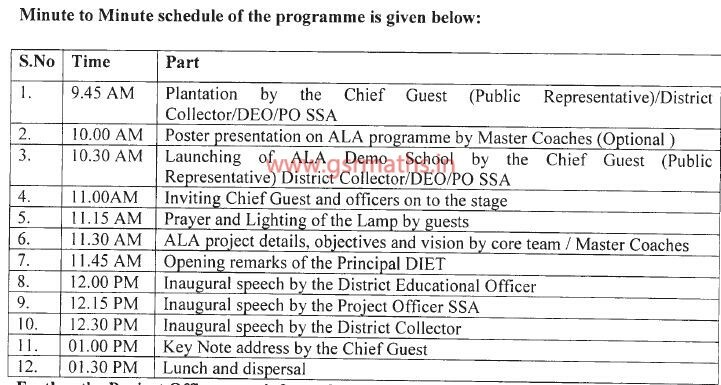 Further all the District Educational Officers and Project Officers of SSA in the State are informed that, the ALA programme will launch in all districts in identified schools in the State simultaneously on 07.08.2017 in the selected ALA demo schools and further informed to invite the following guests and officers to the said programme in each district.